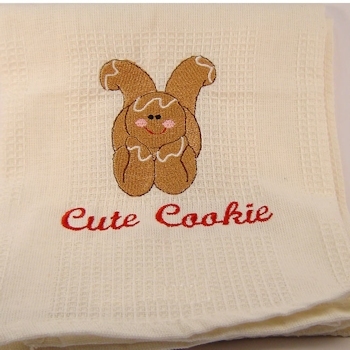 Personalised Gingerbread Man Embroidery Motif on a natural cotton Tea Towel. Personalised Gingerbread Man Embroidery Motif on a natural cotton Tea Towel. Super cute embroidered Gingerbread man on a natural beige cotton tea towel hemmed on all the sides. 52 x 72cm (We no longer use the waffle tea towel, they are now plain flat cotton tea towels.) If you want to upgrade to a pure linen tea towel please select this from the fabric option. You can have any name or brief message you want sewn on this tea towel. Choose a thread colour and letter font style for the text. The tea towel is personalised to order by AmysGifts.co.uk just for you.